THE SMUGGLERS' CAVES by Fiona Cullen, details of this abridged book for students below. As it is no longer a self-published book, I cannot publish it or extracts from it on this blog. In his recent autobiography, Keith Richards has revealed that the Stones played a gig in the caves for a debutante's coming-out. Keith Richards' memory of the caves is ...that they were BIG. Read all about it in this week's Hastings Observer. 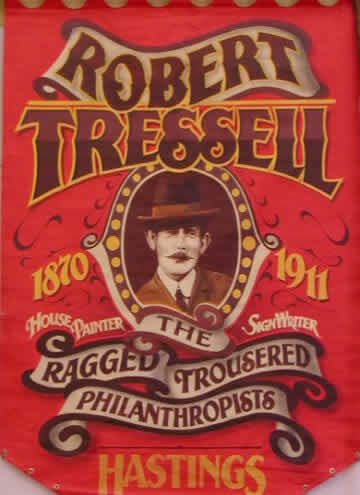 It's Hastings author Robert Tressell's centenary this month. The Smugglers’ Caves is a pageturning mystery that is finally solved by four friends, each of whom has their own very real problems to face (parents, lack of parents, bereavement, disability and fear of being deported). While the story centres on the race to expose a smuggling ring, there is also a crazy backdrop of eccentric literary and historical figures who once lived in or stayed in Hastings – including the pre-Raphaelite painters, the great Shakespeare scholars Garrick and Capel and the poets Patmore and Thompson. It’s a ridiculously educational story without seeming to be, and culture-vulture parents (as well as parents who have had enough of dumbing-down) will be delighted to see the learning their 11-year-old-ish offspring are absorbing as they read The Smugglers’ Caves. That’s if the parents can put the book down long enough to let their children read it. When I read the first few chapters at the West Cork Literary Festival, everyone listening vowed to visit Hastings and see for themselves the caves, the castle, the fishing harbour, the hills and the Tudor streets of the Old Town. As well as literary and historical figures the book also includes some real life characters including the manager of the Smugglers Adventure, Trevor White (Joe in the book), who says he is delighted that Fiona chose the caves as the location for the story. “I’ve always been fascinated by the caves and their extraordinarily rich history. For Fiona to have incorporated so much of that into this book is fabulous – we’re hoping it will provide a boost to visitor numbers and we’re already looking forward to the second part of the series!,” he added. copyright Fiona Cullen-Skowronski. Watermark theme. Powered by Blogger.